This Bag measures about 5 X 7 inches, not counting the handle. It's the perfect size for a reusable lunch bag. I bed if you brought your lunch to work in this bag, not one would steal it! but the I Love This yarn is a good choice as well. sc back down the strap to the opposite side. Join and tie off. Sew to the center of the back edge of the bag. Sew button in place on front of the bag. Place one on each the side of the head and sew on with tail of yarn and needle. join and tie off leaving an 18 inch tail of yarn. about 30 or 35 times. and slip it through all the loops and tie very tightly. Clip all the loops and trim evenly. Use the two long yarn pieces to secure to front of Bag. 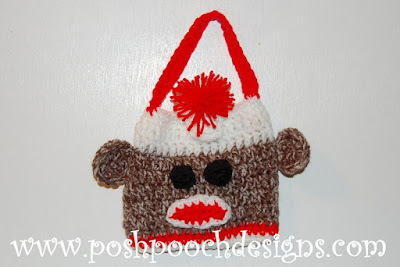 I Just Love Sock Monkeys!